Industrial Processing Equipment Specialists, Inc. (IPES, Inc.) was started in 1997. Our vision was to provide high quality and high powered magnets for magnetic separation and magnetic material handling equipment worldwide to a wide variety of industries and providing great service before and after the sale. Ranging from food manufacturing to construction recycling, we can provide the appropriate magnetic separator to fit your individual application. 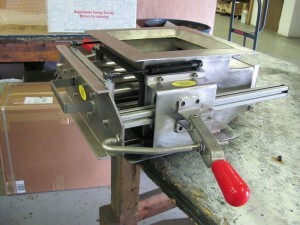 All of our Magnetic Separators and Magnetic Sweeper Pickup Tools are manufactured in the USA. We pride ourselves on our high strength magnets, innovative magnetic designs, durability and outstanding performance, all at the most competitive pricing. Our engineers can design a custom magnetic separation system to fit the most demanding applications. Quality and value are principles we have committed to providing in every facet of our business and which have made us an industry leader in the fields of super strong magnets for Magnetic Separation, Magnetic Floor Sweepers and Magnetic Pickup Tools.